Two years and three months ago, the NPP formed government and inherited from the past Mahama-led NDC administration a mismanaged and distressed COCOBOD which was facing economic downturn. In fact its annual tonnage deficit was spiralling out of control, confidence of cocoa farmers who are its largest stakeholders was plummeting and the world looked with growing anxiety to the abilities of President Akufo-Addo led NPP administration to save the innocent cocoa farmer from the consequences of the NDC's incompetence which was taking cocoa industry to near extinction like the NDC actively did circa 1999/2000. As part of what was urgent at the time for the Akufo-Addo led administration in order to rescue this worrying situation is what is called "REHABILITATION" of cocoa plants/ trees/ farms and Pollination. In essence, this rehabilitation is a four-year program starting from 2018-2022. COCOBOD has secured Two Hundred and Twenty Three Million Dollars ($223m) for work on an estimated 156,000 hectares of overaged farmland. 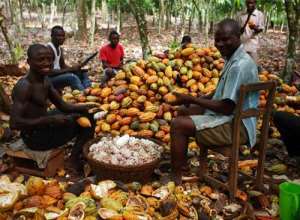 The Akufo-Addo-led NPP administration having demonstrated it's commitments to putting first the cocoa farmer and Cocoa production has in place a workable REHABILITATION plan which has taken effect. This entails pruning, disease control & rehabilitation of overage farms (farms aged 30yrs and above), rehabilitation of CSSVD farms. This effective program has as its components of job creation - 440 Disease Spotters, 251 Technical Assistants, 246 Machine Operators. Each of this workforce earns at the end of every month one thousand, three hundred cedis (Ghc 1300) on this contract, renewable after every 12 months. It is estimated that, for every one month 18,600 Pruning is to be undertaken. On each hectare of land, the agreed farmer is remunerated with five hundred and ninety Ghana cedis (Ghc 590). With regards to instances where owner of the farmland (case of allodial title holders of farm) is separate from the farmer, each is indemnified with a commiserate Ghc 590 benefit. In fact, COCOBOD takes the cost of the labourers to cut down the old/ailing plants. Helpfully, as part of COCOBOD's adoption of AGRO-FORESTRY as a tactic to provide adequate shade for the quality development cocoa plants, it replaces each hectare with One hundred thousand (100,000) suckers and Cocoa seedlings. The relevance of this crucial intervention as COCOBOD foresees as certainty, is the farmer harvesting plantain in the second year and Cocoa in the third year. Understandably, COCOBOD pays expenses for the period under treatment and hands over to the farmer in the third year for farmer to enjoy full earnings from harvesting their cocoa. COCOBOD, however, is engaging with an industry to buy from cocoa farmers, plantains they would've harvested , two years into the rehabilitation program. Subject to pollination, the Akufo-Addo led NPP government is embarking on this important exercise with two vital intents- to create jobs and to increase output levels of Cocoa. Verily, about 20,000 youthful population currently across cocoa growing areas in Ghana are engaged for the services of pollinating cocoa plants/ trees. The benefits of pollination have been proven to be a fast increase in the yield of each plant. Likewise, the benefit to the employees drawn from their immediate respective community which means they are relieved from transportation cost is a monthly wage of four hundred cedis (Ghc 400). $68m have been earmarked for the Pollination exercise which will last till 2020. It is expected that the number of pollinators would increase to 30,000 next year. Disappointing as it may seem, the Mahama-led NDC had since 2012 refused to do rehabilitation exercise. Dr Opuni was of the 'disturbing' view that, farming was a commerce and that it was the responsibility of farmers to prune their own sick trees at their own expense. It is said that then management disagreed with Dr Opuni's unreasonable view imposed on COCOBOD; alas, one Mr Eric Kwame Adjei a former deputy director would bear the brunt of the intolerant Dr Opuni resulting in his 'very strange' transfer to Hohoe. By and large, these major interventions by the Akufo-Addo led NPP administration are to a greater extent, meant to put the cocoa farmer on a secure economic footing, preserving the dignity of the cocoa farmer, and strengthening the cocoa industry.